We review the use of molecular dynamics (MD) simulation at MIT to gain insight into the molecular level mechanisms of polymer crystallization from the melt. Simulations are constructed to observe nucleation and growth processes separately. For nucleation, we induce elongation under constant load before quenching, to accelerate the process in accord with experimental observations. We observe multiple nucleation events, increased perfection of crystalline lamella on the 5nm length scale, and lamellar thickening. Nucleation is characterized by a competition of rates. The rate of spontaneous ordering competes with the rate of conformational relaxation to determine the number, size and chain tilt of the crystallites. To measure lamellar growth, we perform simulations for C20H42, C50H102 and C100H202 melts. From these simulations, we obtain data for the growth rate of n-alkane crystals over a range of temperatures and molecular weights. We construct a general crystal growth model that can be parameterized in terms of chemical properties of polymer chains and constants derived from polymer physics. 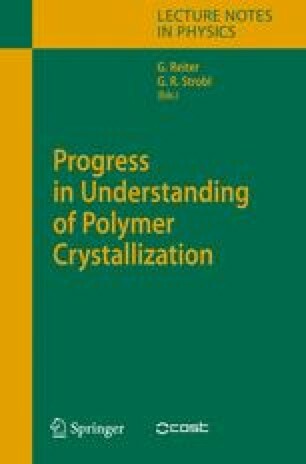 Analysis reveals that the crystal growth rates of alkanes and polyethylene can both be described by the same relationship when the appropriate relaxation time is used to describe the transport barrier to crystallization. For chains shorter than the entanglement length, this is the Rouse time. For chains longer than the entanglement molecular weight, transport limitations are modeled by the local relaxation of an entangled segment at the interface.